In heavy-duty industrial operations, water vapor in compressed air equipment can lead to premature failure, corrosion, frozen air lines, quality control issues and a range of other operational problems. 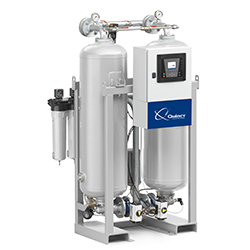 A desiccant air dryer system purifies compressed air by absorbing moisture. You can find these systems in any industrial application in which reliable equipment and exceptional quality control is necessary. 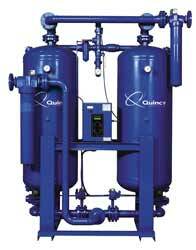 Quincy Compressor manufactures a full line of desiccant air dryer systems. Our products provide air purification from -40°F PDP down to -100°F PDP. These dryers are built and designed to provide the smallest footprint possible while ensuring maximum performance. Quincy desiccant dryers have ASME and CRN designed pressure vessels standard. Also, standard with the desiccant dryers is a 2-year package warranty and a 5-year valve warranty. The QHD / QDTH is an industrial duty heatless purge desiccant air dryer that removes moisture from compressed air through a process known as Pressure Swing Adsorption. Saturated compressed air is directed over a bed of desiccant (Q Sorb) an enhanced formula of activated alumina. As the saturated compressed air flows up through the desiccant bed its moisture adheres to the surface of the desiccant and is removed through an exhaust muffler during the regenerating cycle. Heatless dryers use 14-18% of the compressed air flow for regeneration. Quincy Heatless Purge Regenerative dryers are the least costly desiccant dryers to purchase but use the most purge. They typically represent the best value in systems under 600 cfm. The QDHP is an industrial duty heated purge desiccant air dryer that removes moisture from compressed air through a process known as Heat Assisted Pressure Swing Adsorption. Saturated compressed air is directed over a bed of desiccant (Q Sorb) an enhanced formula of activated alumina. As the saturated compressed air flows up through the desiccant bed its moisture adheres to the surface of the desiccant and is removed through an exhaust muffler during the regenerating cycle. 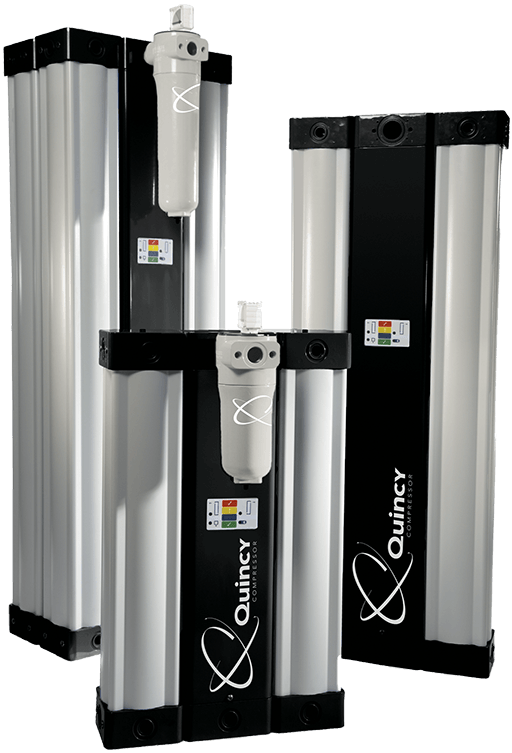 Quincy Heated Purge dryers are more energy efficient than heatless dryers in that they only use 3.5% to 7% of the flow for regeneration. Quincy Heated Purge Dryers are almost always the best value in flows larger than 500 cfm. These dryers combine heat with forced ambient air for regeneration. The QBP is an industrial duty Blower purge desiccant air dryer that removes moisture from compressed air through a process known as Heated Ambient Pressure Swing Adsorption. Saturated compressed air is directed over a bed of desiccant (Q Sorb) an enhanced formula of activated alumina. As the saturated compressed air flows up through the desiccant bed its moisture adheres to the surface of the desiccant and is removed through an exhaust muffler during the regenerating cycle. Quincy Blower Purge dryers use 1.75% of the flow for regeneration. Blower purge dryers are the most costly desiccant dryer to purchase but are the most efficient to operate requiring little if any purge air for regeneration. These dryers are very desirable in applications that can’t spare any flow for purge. These compact dryers use a small portion of dried compressed air to regenerate the offline tower. The efficient new QMD modular desiccant dryer delivers the best drying capabilities at a fraction of the price. From 55cfm up to 550cfm this dryer delivers a -40 degree F instrument quality or -100 degree F process air for system demands at only 16% purge. 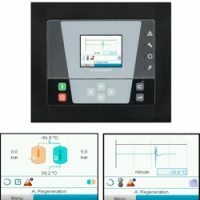 Equipped with an Airlogic 2 controller, the QMD allows for easy examination of various parameters and alerts for servicing. Desiccant air dryer systems consist of a pair of towers containing silica gel or another desiccant. 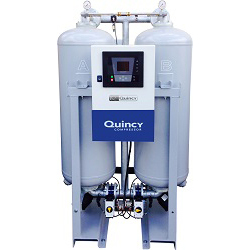 Quincy machines use our proprietary Q-Sorb product, an enhanced formula derived from activated alumina that provides improved absorption, lower pressure drop and higher crush strength. As air passes through the towers, water vapor clings to the desiccant, effectively stripping it from the air until a desired moisture content is met. We measure moisture in pressure dew point (PDP). PDP refers to the temperature it would be necessary to cool air to achieve the same amount of dryness. For example, in many process industry applications, a PDP of at least -40°F is recommended. In other words, air is required to have the same moisture level it would have at -40°F. 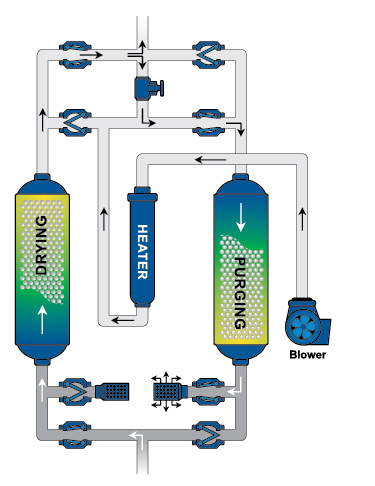 Desiccant air dryers work in conjunction with an industrial air compressor. Their dual tower design allows you to time drying operations to a standard NEMA cycle, in which the one tower regenerates (purges) while the other performs the drying function. This prolongs desiccant life and allows for continuous operation for extended periods. A desiccant air dryer system is an important component of any industrial operation in which compressed air of a uniform quality is required. Most air dryers run off electrical power. Because they are for continuous use, however, they can represent a significant operating expense over time. That’s why it’s important to choose a machine from a manufacturer you can trust. Quincy Compressors has been in business since 1920. Our products are designed to work together to provide a complete compressed air solution for any heavy-duty or industrial application. Our current line of products includes heatless, heated purge, blower purge and modular desiccants.